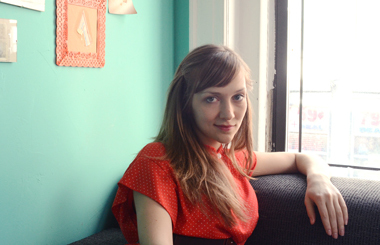 English alumna Catherine Lacey ’07, writer and 3B co-founder. Writers work odd jobs. Always have, always will. Catherine Lacey ’07 has made an odd job for herself that provides something all writers cherish: time. Even famous writers begin in obscurity. While they type their ways into the annals of literary history, they support themselves as janitors and garbage men, sales clerks and bartenders. Harper Lee, who wrote To Kill a Mockingbird, was an airline reservation clerk for eight years. Jack London was an “oyster pirate,” stealing oysters from the beds of large farmers and selling them on the Oakland market. Langston Hughes was a busboy, John Steinbeck ran a fish hatchery, and, of course, Herman Melville worked on whaling ships. After dropping out of Ole Miss, William Faulkner became the university’s postmaster. As tedious or adventurous as some of these jobs sound, they all provided the writers time and inspiration—or at least money enough to live. Today, the young writers who will someday be known as the literary masters of the 21st century are, by and large, doing just what their forbearers did—writing for little pay while they support themselves by working odd jobs. Whether English alumna Catherine Lacey ’07 will achieve literary greatness is yet to be seen, but the 27-year-old Mississippi native has already achieved some publishing success and, what’s more, has perhaps devised the perfect odd job for a writer. Lacey is one of the young go-getters responsible for 3B, a hip, collectively owned and operated bed and breakfast in downtown Brooklyn, New York. Her responsibilities include marketing and publicity, as well as daily chores like cleaning and changing sheets. In return, profits from the business pay for her living expenses as well as rent on the floor beneath the bed and breakfast, where she lives with the six other people who own and run it. Lacey says she works 15 hours a week on 3B-related tasks, and during her downtime, she writes. She has completed a novel and a memoir since 2010, the year she graduated from the nonfiction MFA program at Columbia University in New York City. She has also composed short stories, articles, and interviews for literary journals and popular magazines. She’s currently shopping her memoir to publishers while continuing to feverishly write. In August 2005, Lacey was looking forward to adjunct professor Martin Pousson’s creative nonfiction workshop when Hurricane Katrina struck on what would have been the first day of class. She evacuated to Chicago for a semester and returned to a swamped apartment, but to her delight, the workshop had been rescheduled for the spring. Under Pousson’s tutelage, Lacey studied Joan Didion, food writer M.F.K. Fisher, and the essays of George Orwell. She worked with Pousson, also a Loyola English graduate, on a series of essays for her senior thesis, including one exploring the shady activities of rebuilding nonprofit Common Ground. She used that essay to apply to graduate school at Columbia University, whose writing program is one of the nation’s best. They accepted her, and off to New York she went. So, she did what anyone in her situation would do: She bought a ticket to New Zealand, where she would hitchhike, work on organic farms, and try to write a book. That whim only lasted a few months, but her final job in New Zealand, at a lodge, clued her in to the potential benefits of working in the hospitality industry. Upon her return to New York, Lacey found a sublet on Craigslist in a cooperative living space beneath what was fast becoming a defunct bed and breakfast. The B&B’s operator at the time was overwhelmed trying to run it by himself, and eventually stopped cleaning, getting guests, and paying rent. He disappeared, leaving behind a mountain of dirty sheets, discarded furniture, grime, and debt. When the building’s landlord showed up looking for him, he instead found Lacey and her six new roommates. They negotiated a deal under which they would assume the lease for the floor on which they lived, as well as the commercial space upstairs. Thus, 3B was born. After securing an outside loan from one of the roommates—who had made money working for a successful tech startup—the group cleared the junk, refinished the floors, built a kitchen, painted, decorated, and transformed the space into one of stylish comfort and accommodation. 3B features four rooms of various sizes, all with big windows, high ceilings, and modern trappings, as well as a common room. Its accoutrements came from vintage stores, friends, and flea markets, and are at turns quirky and elegant. The bed and breakfast is located near almost every major subway line that runs through Brooklyn or Manhattan, and its rooms are affordably priced, from $45 for a dorm-style bed to $179 for a private room with two queens. 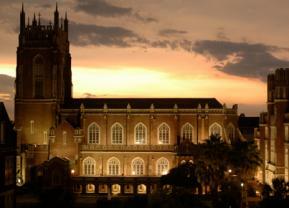 Loyola community members who announce themselves receive a discount. Lacey says business has been going great. She and her cohorts have a list of future possibilities for 3B that includes, among other things, opening a satellite location, perhaps in New Orleans. But for now, Lacey says she is content just to have time to write. She recently finished a draft of a novel and has a handful of essays and stories in the works. Whether she becomes a note in literary history remains to be seen, but in terms of having a good odd job, she’s on the right track. Nathan C. Martin is the marketing copywriter for Loyola’s Office of Marketing and Communications. Photos courtesy of Petra Valdimarsdóttir, Cody Swanson, and 3B.